“The Big Short” stars Rafe Spall, Jeremy Strong, Steve Carell, Ryan Gosling and Christian Bale (not pictured). Photo credit: Paramount Pictures. The Great Recession in 2008 had many causes, but no factor was bigger than the belief that the prices of homes would keep rising. 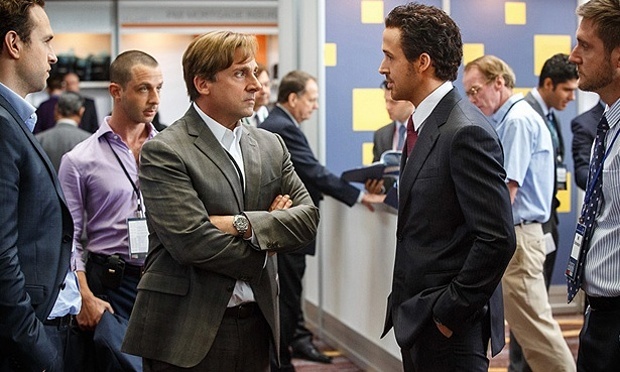 The Big Short is an entertaining story of the small group of oddball investors and bankers who realized that the seemingly solid housing industry was more a house of cards. The bio-drama commences in the early 2000’s with Ryan Gosling’s (Only God Forgives, 2013) character, Jared Vennett, narrating. Vannett, who is also the main character, describes the process of mortgage-backed security, which fueled the subprime mortgage crisis. This method was invented in the early 1980’s by Wall Street, which packaged individuals’ mortgages into a bond that investors could invest in. The simple investment premise was that when you bundle enough mortgages together you essentially reduce the default risk in aggregate to a tiny amount. The agencies that rate the risk of investments agreed and gave it a high rating – AAA – which is the same rating that blue-chip companies like General Electric would receive. Over the next 30 years, the mortgage-backed security and the housing market boomed with everyone getting rich in the process. Although the film is entertaining and informative, there are a few comedic cameos that McKay throws in the script that don’t hit their mark. Still, McKay and his cast did create an engaging adaption of the financial crisis that threatened the American economy to its core. Audiences meet the brilliant, Dr. Michael Burry (Christian Bale, Knight of Cups, 2015), a former neurosurgeon, who now runs his own investment fund and has uncovered the truth that the mortgage-backed security market is a bubble. He wanted to take is investors’ money and bet against the housing market – something that defied all conventional wisdom. When Burry travels to New York City to place his bets, the Wall Street banks laugh him out of the room, but are happy to take his money. Word gets around on Wall Street about Burry’s seemingly stupid bet, and Vannett looks into the details of Burry’s theory, realizing he’s correct. Much of the market is based on very shaky mortgages, which will default when interest rates are expected to increase in the next few years. Vannett begins selling this idea to other investors including Mark Baum (Steve Carell, Freeheld, 2015) and his hedge fund, along with another group of young amateur investor’s working out of a garage, mentored by Ben Rickert (Brad Pitt, By The Sea, 2015). The remainder of the film revolves around the investigation into the abuses of the mortgage industry and how the problem spread like wildfire. Only time will tell before the rest of the market figures it out. Director Adam McKay, is mostly known for his comedic wit and writing partner, Will Ferrell, and also directed Anchorman (2004) and Talladega Nights (2006). This was his first foray into more dramatic work, but he does a capable job with the story and his cast. Christian Bale, who is well-known for his immersion into roles, does a great job with Dr. Burry, who is brilliant, but overshadowed by his social awkwardness and strange ticks. Carell also shines as the hedge fund manager who despises Wall Street greed. Although he’s uncovered a way to profit off of their stupidity, he still struggles with the decision to profit off of what will undoubtedly lead to a painful U.S. economic recession. The Big Short is based on the book of the same name by Michael Lewis, a former bond trader who left Wall Street to work as a writer. His books, “The Blind Side” and “Money Ball “ were adapted to the big screen and became major box office hits, garnering Oscar nominations. The film succeeds because it provides an interesting and engaging view of a complicated topic. Bottom-Line? Even if you don’t know much about Wall Street and finance, you will still find this movie entertaining due to the stellar cast’s performances. It’s also a great educational piece about a pivotal historical event in the last 30 years.